We have uploaded a YouTube video of the basic raw footage from the 1st test run on the Polini 250 motor. Today were finishing up some of the last tasks necessary before we can run the engine. In the picture below we are installing the cylinder head temperature/water temperature probe wiring on to the existing Polini CHT water temperature sender. As we normally do before we use any instrumentation we calibrate each of the probes and the instruments to verify that they are in fact accurate. In this case here we have the cylinder head/water temperature probe being calibrated starting at room temperature and working our way up to around 200°F. 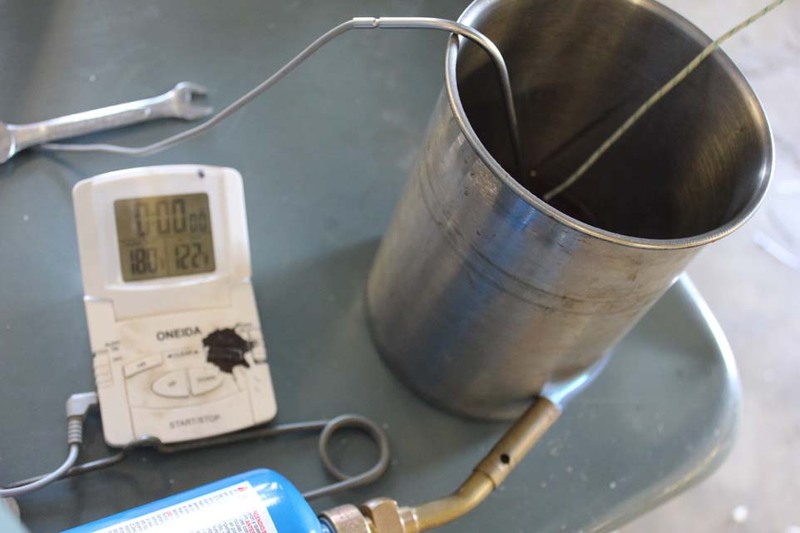 We have both the digital thermometer and the cylinder head temperature probe in the stainless steel container in solution with 50/50 anti-freeze. 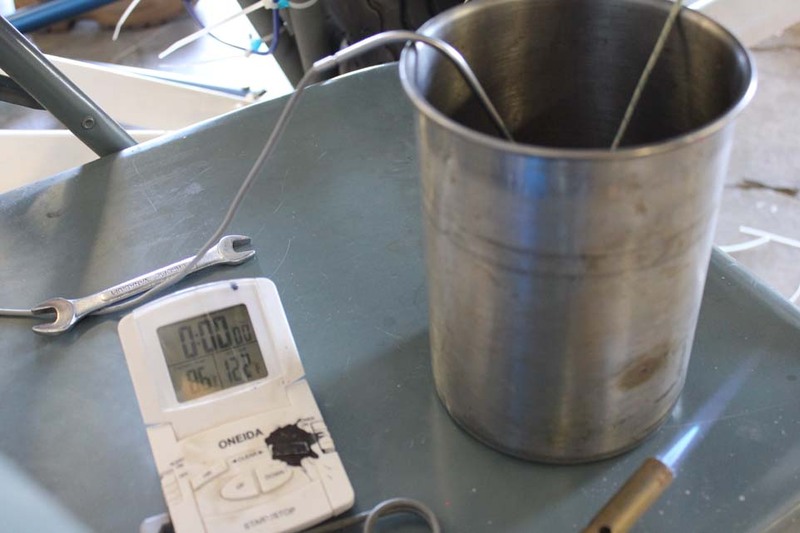 We heat the stainless steel container with the antifreeze and it and take temperature readings on both the digital thermometer and the instrument in the cockpit working and 5° increments throughout the entire range that we will be using. 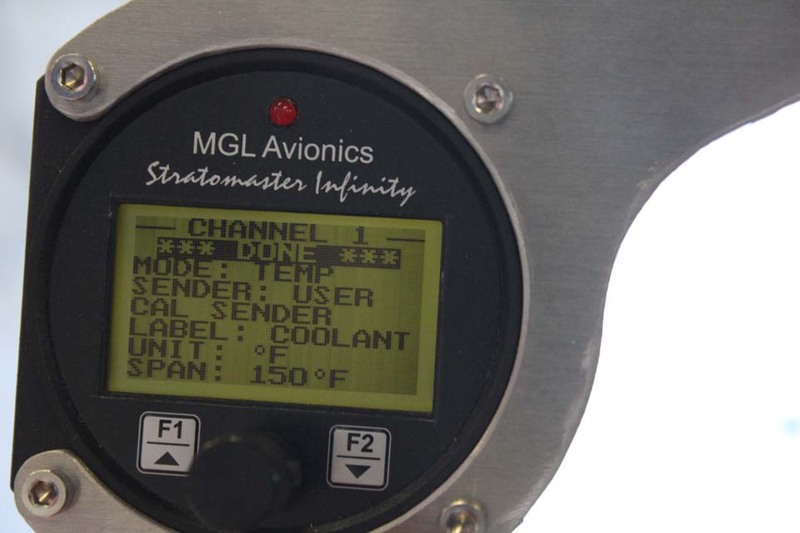 We are using the MGL avionics and instrumentation system. 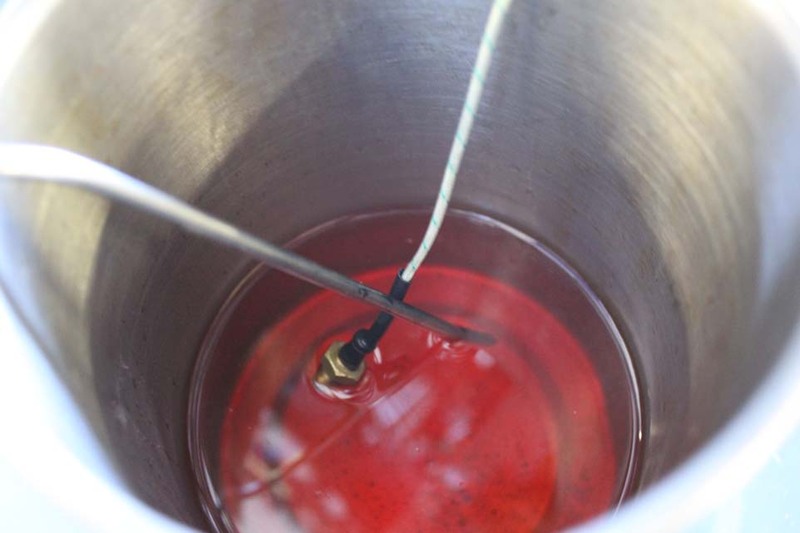 The Polini water temperature probe does not work with this instrument and so we will be adding an additional Westac water temperature probe into the coolant outflow fitting in order to use this instrument. 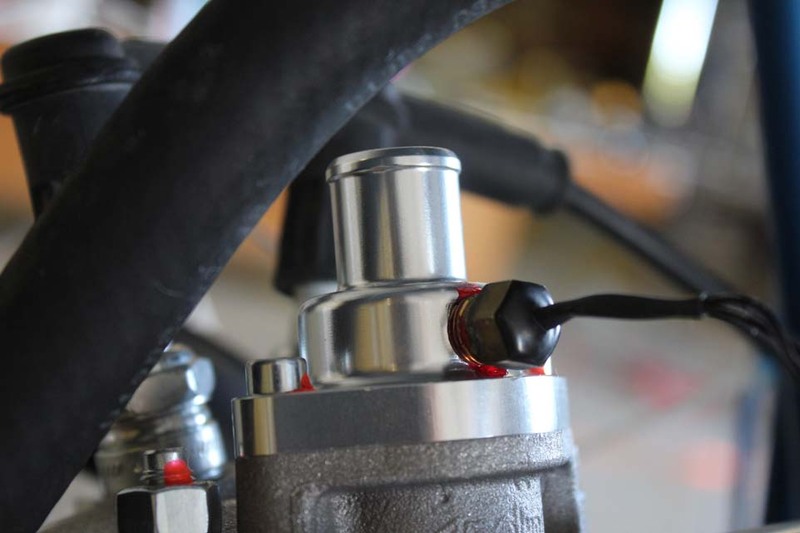 A picture of the modified water outlet manifold hose fitting with the West tack water temperature probe inserted. Because we needed to insert the water temperature probe into the outlet it was necessary to drain the fluid from the radiator and engine. So this was a great time for us to quantify exactly how much antifreeze/water is in the entire cooling system. Ironically the total quantity came to exactly 32 ounces. 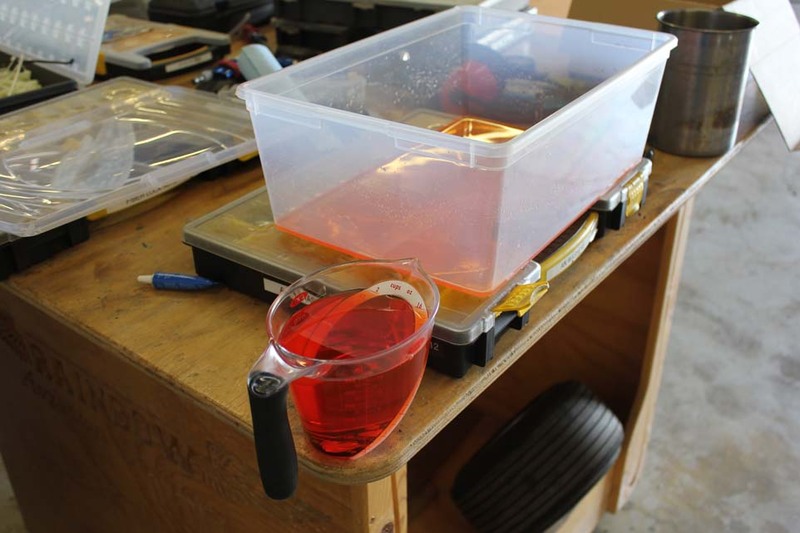 Antifreeze is approximately 9 pounds per gallon. 9÷128 ounces per gallon equals .0703125 pounds per ounce x 32 ounces = 2.25 pounds. that’s pretty reasonable for an entire cooling system. The G meter which makes up the last of our 6 instruments that we will be using for the test flight series on the Polini 250 arrived today and so we are now able to finish wiring up the remainder of the instrument panel wiring harness. We were able to fire up the engine while it was still in the hanger. Very easy to do since the propeller is driven by centrifugal clutch which does not engage until the RPM is raised well above idle. Once we had run the engine and did a preliminary check of all systems we move the airplane outside the hanger to continue the run-up. 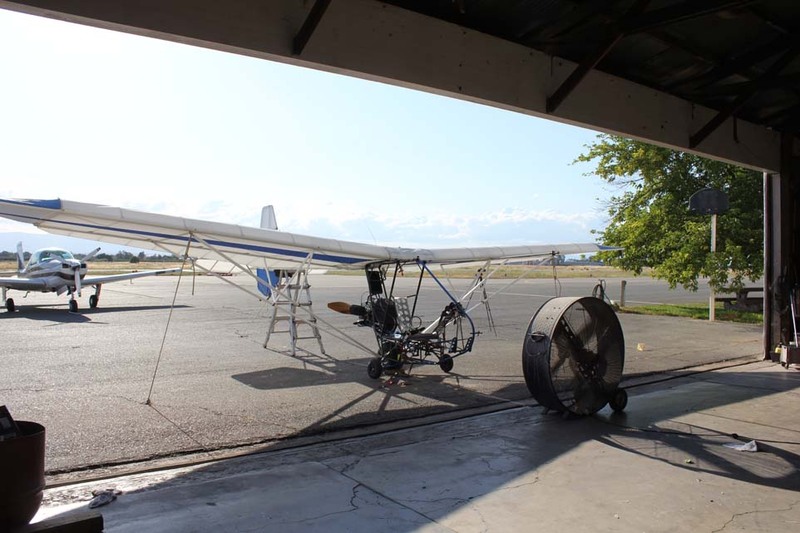 Once the airplane was outside we were able to run it up using a stepped break-in procedure that we have developed similar to the Rotax type of break-in procedure. we operated the engine at varying rpm’s up to about 5000 RPM and a total of about 10 minutes monitoring water temperatures on the head temperature and exhaust gas temperature. Once this initial run was accomplished we shut the engine down for an inspection and to service the radiator system which by now should have eliminated any air within the system. Once we had checked all of the systems and added a small amount of radiator fluid we continued with the break-in procedure.The goal was to give the engine enough time at varying rpm’s to slowly work up to where we could do our 1st full throttle operational check. 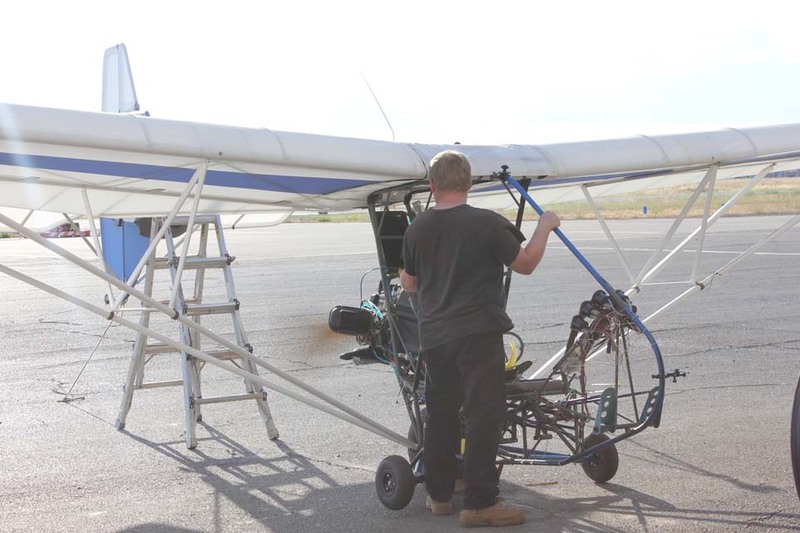 One of the most important variables with any two-stroke engine is engine loading and we were quite concerned that we would not have the proper engine loading during the break-in procedure because we had designed our own propeller. And you can imagine how astonished we were when we did our 1st full throttle run and the engine came to 7424 RPM. Our target goal was 7500 RPM. I’d like to take credit for the good propeller design but I must admit we were just damn lucky. Just some final notes about my impressions of the engine during the engine run that we did today. Phenomenal, amazing, awesome, and on and on. We pulled the choke during the 1st start and the engine started after about 2 seconds. Even as a new engine it idled perfect without the propeller spinning. The noise level is extremely low for a two-stroke engine very impressive. During the run-up sequence the engine was very smooth and virtually no vibration could be felt except a small residence in the airframe. On the 3rd start I had Jason do the start and he held the starter longer than he should have and I said “the engine is running” he let off the starter and said “I thought that sound was just the starter” the starter noise was louder than the engine idling. With the small 48 inch diameter propeller with the large blades the propeller noise was very low. It will be interesting to do some static RPM thrust checks to see how much thrust were able to get with this propeller. The engine operated smoothly and responsively through the entire RPM range. And although we don’t currently have the tach hooked up we were using an optical tachometer which we would normally used to validate tach accuracy. 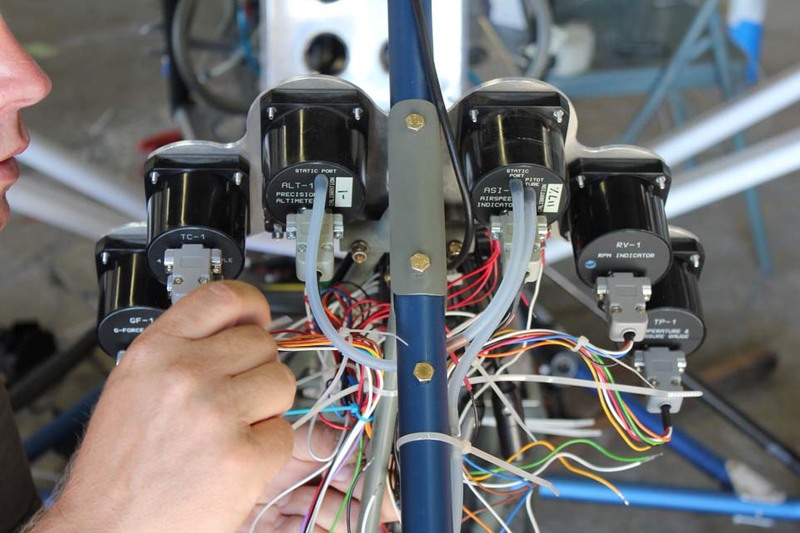 We are working with MGL avionics to ensure that we are in concurrence with them on exactly how to interface their instrument with the Polini 250. Normally the Polini instrumentation uses a system very similar to the tiny tachometer where they wrapped wire around the spark plug lead. I’m looking forward to getting the airplane into the air with this motor/propeller combination so that we can start collecting some data. My gut level feeling is this is going to be the absolute perfect two-stroke motor for this airframe.